Rock Paper Lizard: Deep sleep. I’ve not worked in an aquarium, but I bet if you did, visitors would sidle up to you and tell you in hushed voices that one of the seals was dead --lying on the bottom of the pool, flippers curled, its only movement a gentle side-to-side rocking, courtesy of currents generated by the hyperactive dolphins. It’s okay, you would say. It’s just sleeping. 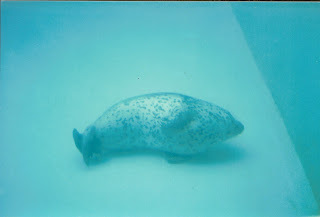 And sure enough the seal would stir, flick its flippers, and slowly rise to the surface like a blob in a lava lamp. It would take a deep breath, and then instantly fall back asleep, sinking down, down, down, and bouncing gently on the bottom of the pool. Wild seals do this too, apparently. They will also sleep at the surface, with just the face above water, a position known as “bottling.” They also sleep on shore. In this sea mammal pool, dominated by cavorting dolphins, bottling would probably not be an option. So why not sleep on shore, well, the side of the pool? I have no idea. You would have to ask the seal. This particular pool, by the way, was at the Steinhart Aquarium in Golden Gate Park, San Francisco. I wondered about bottom-sleeping in wild seals, the ones I see along rocky north Pacific shores. Sandy areas would be fine, but surely there aren’t always flat, predictable bottoms below. So much potential for rude awakenings: Rocks, crevices, barnacles, urchins, ow! Up it rises again, slowly, slowly, big breath, then down, down, down, a gentle bounce, and still. No, it’s okay. It’s just sleeping. we did the same thing at a drive through wildlife park. We reported a dead llama. Not dead just asleep. duh.